With Clash of Clans being such a hit in the mobile gaming industry, it took no time for Supercell to come up with stellar games like Boom Beach and now Clash Royale. The difference here is that Clash Royale has a new feature that the previous games are lacking—real-time PvP play. That’s what makes this title more fun and exciting, even for those who aren’t that into mobile games. In Clash of Clans, you had to deploy troops to take out your opponent’s base. However, you were still technically playing against the AI, as the defender isn’t there real time to protect his/her base. 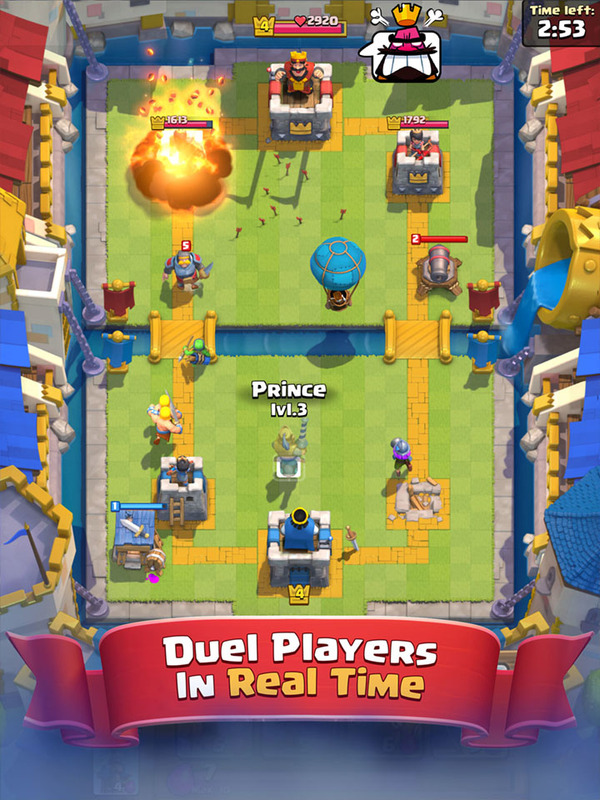 In Clash Royale, you’d actually be playing real-time against another player. He or she can react to the plays you make. That means, those silly exploits you use against AI won’t work on good players. Clash Royale is a nice mix between Clash of Clans and Hearthstone, and I think Supercell did a really great job with this game. At least for me, this is the first real-time PvP game I came across throughout the years of trying out various mobile games. The graphics of the game has a very “cute” look to it. It also uses the character designs from Clash of Clans. So, if you have played Clash of Clans, then the graphics will be very familiar to you. Most of the characters are happy and there is no blood involved. This is to be expected since it is targeted towards children. If you like top notch 3D graphics, you will be quite disappointed with the cutesy visuals. You and your enemy both have 3 towers, with one being the King’s castle. The main objective is to destroy your enemy’s castle or more towers than your opponent. If neither of you destroys anything, you go into overtime mode for a minute and whoever destroys a tower first wins. And if nothing gets destroyed after that, the game ends in a draw and both parties gain no trophies. You are given 8 different cards at your disposal to try and outwit your opponent. You have 4 cards at any given time and once they get used up, they go back on standby mode. It will be available once you use up more cards. You also have 3 minutes to get your opponent’s towers. One of the best things is that it’s free to play and you can win despite not paying for anything. This game is very skill based and requires a lot of quick thinking to gain an advantage against your opponents. Skilled players know which cards are great against specific cards and they use it to their advantage. The matches are quick to find at lower arenas and the battles are short. That means you can play a few matches which usually lasts anywhere from a minute to about 4 minutes. This is perfect for casual gamers that just wants to have some fun while not having to dedicate too much time to it. I personally have not used real money in the game yet and I am able to get to arena 4 ranking with mostly basic cards and a few rares. You can also join a clan to receive cards from other clan members. This will help speed up the entire leveling process for your cards. Unfortunately, the rewards stagnate once you get about 4 chests. Each chest also takes quite a bit of time to open. That “forces” impatient players into spending gems (with real money) to speed things up. You are also unable to get more rewards as long as you have 4 un-opened chests. Most people would spend their time building and customizing their decks; I find them to be the most enjoyable parts of the game. You get to craft your own unique deck that suits your own playstyle. You can build a tower defense heavy deck with plenty of small troops. 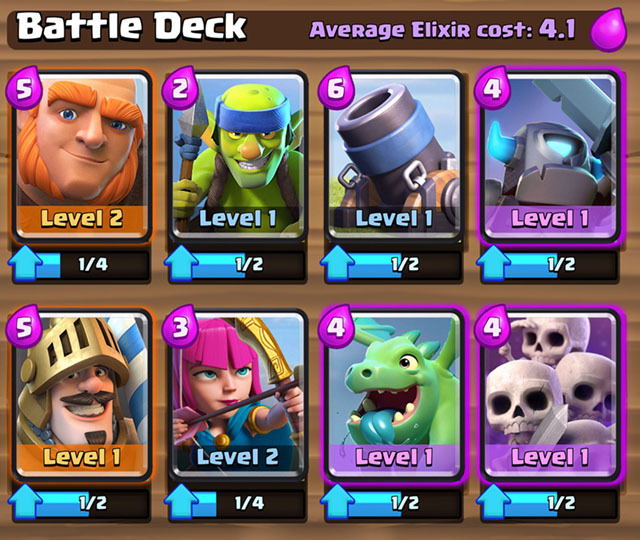 You can build a powerful deck that only consist of heavy building hitters such as the Mini PEKKA and Prince. In other words, you can find different ways to own your opponent. The game is engaging and can be very addicting; it’s easy to get hooked, so beware if you happen to have low self-control. I can definitely see similar types of games coming out with real time battle options. This is what makes a game exciting for most players due to being to play with other people in real time, which is what's lacking in the mobile gaming industry at the moment. If you have been shying away from mobile games due to lack of complexity and strategy, you might want to try Clash Royale. It has all the elements of a good game—strategy, quick thinking, real-time battles versus real players, and a whole lot of fun. Author Bio: Kenny is the owner of OnlineFanatic.com and is fond of writing on various gaming topics during his spare time. You are welcome to drop by and say hello or talk about gaming and entertainment on his website.